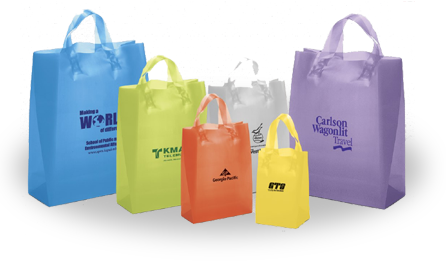 Learn more about our custom bag printing and ordering processes : 888.724.0887 : Call Now! View the topics below for answers to some of our most frequently asked questions. At Bags-4-Less.com, we take pride in our imprinting quality and ability to vividly produce your design on any of our products.To accomplish this we pay particular attention to the quality of artwork we receive. The following specifications detail our requirements in providing you exceptional imprinting of your logo. Artwork not meeting these standards may incur additional production time. Prior to placing your order, we invite you to send a copy of your art and any questions regarding its printability on any Bags-4-Less.com product to sales@bags-4-less.com. We will review your artwork and make recommendations for achieving the best imprint possible, generally within 24 hours. For best results, please submit VECTOR ART. Vector art contains crisp, smooth lines that retain their sharpness and proportions when edited. When submitting your vector art via e-mail, please forward your compressed files to art@bags-4-less.com and insert your P.O. number and company name in the subject field. Also provide a hard copy (printed or PDF) of your design with your P.O.. Important Note: A scanned image (e.g. .jpeg, .gif, .bmp, .tiff, .psd, .pdf) or art created in a photo/paint program is not considered vector art. In addition, placing, linking, embedding, or copying these images into a drawing program does not convert them into vector art and will not meet our art requirements. Mechanical art is camera-ready and is the size to be printed; is crisp black and white; and requires no touch-up. To assist you with achieving the best possible imprint, we are pleased to offer one free hour of creative artwork services plus one free artwork revision. Free artwork services do not apply to virtual proofs or Design Centre orders. If necessary, additional art services are billed at $56.00 per hour with a minimum charge of $28.00. Stock designs and clip art are available. Call to request a faxed sample sheet or visit our website to view our basic stock design library. For actual pre-production proofs, the charge is $80.00, plus applicable plate charges. Pre-production proofs for ColorVista are $175.00. Virtual samples are available for $28.00, per bag style, per imprint. Orders accompanied by a hard copy will not be proofed unless requested. For best results, artwork must be pre-approved by Bag Makers for printability. Digital art must be vector art. Mechanical art must be provided as a black and white composite, with colors indicated. Ink Imprinting:Colors must be separated by at least ½" of white space to allow for color movement. Please note that some color movement will still occur. Multi-color imprinting is not available on some bags. Minimum requirements for fonts are 10 pt. and 1 pt. lines. Foil Imprinting: Colors must be separated by at least ?/?" of white space to allow for color movement. Please note that some color movement will still occur. Designs with tighter registration must be pre-approved. Minimum requirements for fonts are 10 pt. and 1 pt. lines. Screen Imprinting: Color registration requirements exist and must be pre-approved. Please note that some color movement will still occur. Minimum requirements for fonts are 16 pt. and 2 pt. lines. ColorVista Print Technology: ColorVista is ideal for designs requiring close registration on our non- woven bags. Please submit artwork in CMYK color. For best results, some minor adjustments may be required and you will be contacted for approval prior to any changes. Minimum requirements for fonts are 16 pt. and 2 pt. lines. For best results with our ink imprinting process, artwork consisting of halftones must be pre-approved by Bags-4-Less.com. Such designs must be printed at 30 lines per inch at a 45 degree angle, with tint percentages not lower than 20% nor greater than 60%. Production time begins only after approval of your artwork and credit. Imprinted orders for paper, plastic, and screen printed non-woven bags are available in 7 working days. Exact reorders are shipped within 5 working days. ColorVista orders and reorders are available in 15 working days. Unimprinted orders are shipped within 24 hours. All orders must be received in writing, either via fax or e-mail. Purchase orders may be e-mailed to orders@bags-4-less.com. Also, please include a hard copy (printed or PDF) layout specifying how your design should appear on the bag. Reorders: Please reference your most recent purchase order number and/or Bags-4-Less.com job number. Your hot stamp and flexo ink plates are kept on file for 24 months. For screen printing, screens are reclaimed and screen charges apply to every order. Acknowledgments: Bags-4-Less.com acknowledges every order in writing. Please review this carefully and contact us immediately with discrepancies. Any changes made to an order after receipt must be confirmed in writing and may incur additional charges. Credit Policy: For new accounts a customer information form must accompany your order. A credit application may be submitted as well. Please allow 5 days for processing. In some instances it will be necessary for new orders to be pre-paid. Orders will not be produced without credit approval or pre-payment. We accept Visa, Mastercard, and American Express. Over/Under Run Policy: Stock quantities (100-4,999 pieces) ship exact. Standard Imprinting Colors: Please refer to the inside back cover fold-out for all of our standard imprint colors. Custom Imprinting Colors: $70.00 per color. Not available on Hot Stamp imprinting. For PMS colors on ColorVista or Silk Screen imprinting, call for pricing. Exact color matches are not available. PMS colors will vary on colored bags. Location: Unless otherwise noted, your imprint will be "centered" within the printable area of the bag which, due to product construction, may not be the exact center of the bag. Plate Charges: A one-time plate charge per color is required on all new orders. There is no plate charge on exact reorders for ink imprinted or foil imprinted products within the past 24 months. Screen Charges: The first color/location screen is free. Additional colors and/or locations incur screen charges of $42.85 per color/per location. Split Shipments: $12.00 per address. Special Packaging/Slip Sheeting: $6.00 per box. Plain Bags: 20% off and shipped within 24 hours. Shipping Weights: Weights listed in our catalog are approximate weights per box. Bags-4-Less.com cannot be responsible for differences in actual freight per box versus quoted freight charges per box. Special Freight Fees: Inside delivery, residential, redelivery, COD, international, Alaska, Hawaii and Puerto Rico incur additional shipping fees. Bags-4-Less.com reserves the right to submit supplemental invoices after the original invoice has been issued. Freight & duty fees must be charged on your freight account. To find your plate charge, round up the width and height of your artwork to the nearest inch, then multiply each figure to determine the total square inches of your design. Rush service may vary due to order capacity. Please call for availability before placing your order. *Orders requesting same-day and 1-day rush service are available for Ink and Silk Screen imprinting only. 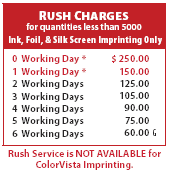 Rush service is available for Ink, Foil, and Silk Screen Imprinting only. Rush service is not available for Color Vista Imprinting. All rush orders must be pre-paid or on approved credit terms. Artwork is required by 10:30 AM CST and must be print-ready, requiring no art services. Available exclusively on our non-woven polypropylene bags, ColorVista is a full color print technology that provides close registration on multi-color designs, even four-color process images! You'll see vivid colors, crisp details, and photo-quality reproduction. Best of all, there are no screen, set-up, or multi-color run charges with ColorVista. For larger quantities, contact our ColorVista team for more information. Available exclusively on our non-woven polypropylene bags, screen printing ofers a cost-efective way to promote your message on our complete line of reusable totes. By injecting an ink through a fine mesh screen, your design is reproduced in clarity directly on each bag. At Bags-4-Less.com, we ofer your first color, first location screen for FREE! For close registration on multi-color designs, use our ColorVista Print Technology for best results. Available on many of our plastic and paper bags, foil hot stamping ofers an upscale retail look to your logo. Using an engraved magnesium plate, together with heat and pressure, we adhere a foil stamp of your design directly onto each bag. It's an elegant look on many of our most popular bags. Our imprinting processes operate in a post-production environment in which imprinting takes place on a bag which is already constructed. This means that some restrictions - such as a fold or a gusset in the bag - may impact its printability and available imprint area. In addition, because colors in a multi-color design are imprinted individually, a space requirement between these colors is required for best results. Each individual product page identifies the required space necessary between colors. ColorVista is not subject to this space requirement. © 2009 - Lightsaber Promotions, Inc.